2018 is already off to a great start! 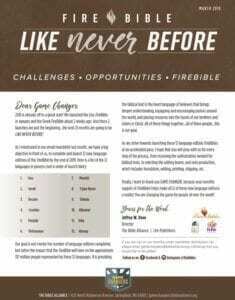 We launched the Lisu FireBible in January and the Greek FireBible about 2 weeks ago. And these 2 launches are just the beginning…the next 21 months are going to be LIKE NEVER BEFORE! Our goal is not merely the number of language editions completed, but rather the impact that the FireBible will have on the approximate 317 million people represented by these 12 languages. It is providing the biblical text in the heart language of believers that brings deeper understanding, equipping and encouraging pastors around the world, and placing resources into the hands of our brothers and sisters in Christ. All of these things together…all of these people…this is our goal. As we strive towards launching these 12 language edition FireBibles at an accelerated pace, I hope that you will pray with us for every step of the process, from receiving the authorization needed for biblical texts, to selecting the editing teams, and onto production, which includes translation, editing, printing, shipping, etc. 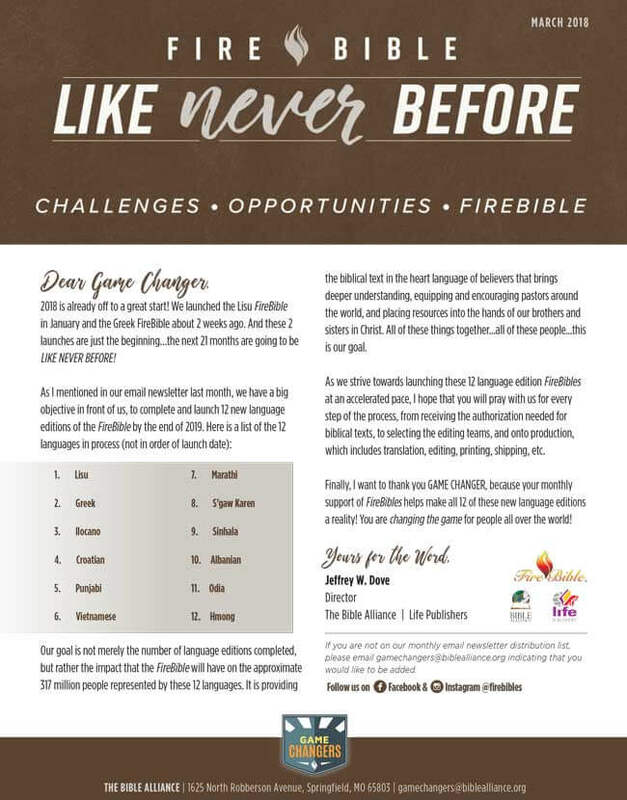 Finally, I want to thank you GAME CHANGER, because your monthly support of FireBibles helps make all 12 of these new language editions a reality! You are changing the game for people all over the world!